Multiple Origins of Astrocytes in the Mammalian CNS. 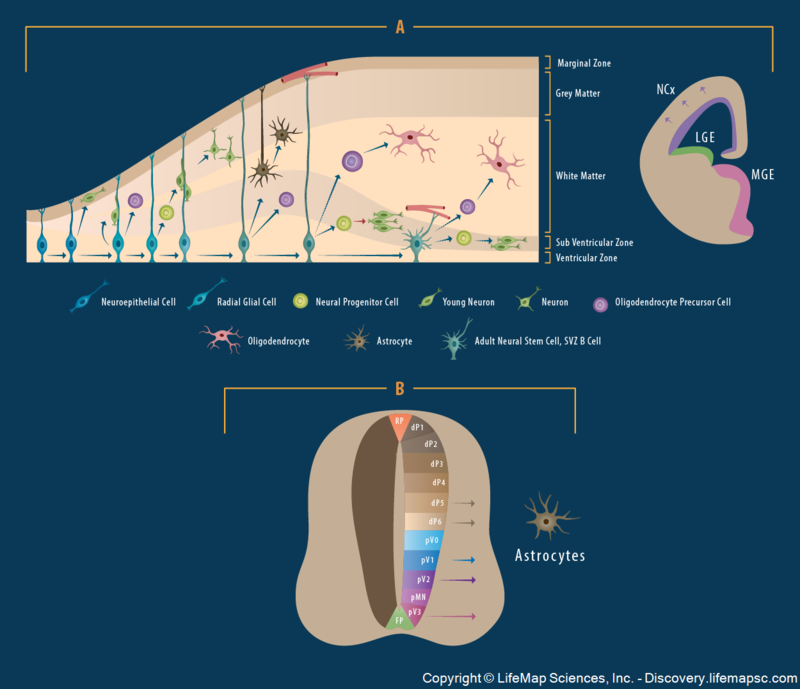 Schematic presentation of the origins and migratory patterns of astrocytes derived from the cerebral cortex and the spinal cord. A. Schematic presentation of the developing mouse cerebral cortex. At early stages, neuroepithelial cells divide symmetrically and, as neurogenesis begins, they are transformed into radial glial cells. The radial glia cells divide asymmetrically to generate neurons either directly or indirectly, through intermediate neural progenitor cells. At the completion of neurogenesis, radial glia transform into astrocytes and oligodendrocytes. In neonatal stages, radial glia continue to generate neurons and oligodendrocytes. A subpopulation of these cells converts into adult sub ventricular astrocytes (SVZ B cells) that continue to function as neural stem cells in the adult. B. In the developing spinal cord, astrocyte precursor cells are generated from the ventral progenitor domains (p1, p2 and p3) and give rise to the VA1, VA2 and VA3 fibrous astrocyte subpopulations in the spinal cord white matter. Astrocytes are also generated from Dbx+ progenitor cells located in the dP5 and dP6 dorsal spinal cord domains.